This entry was posted in Depression and tagged antidepressants, CMHC, drugs, lamotragine, medication, mental health, mirtazipine, Monkey, pregabalin, venlafaxine. Bookmark the permalink. Back in the day I was on the clinical trials for venlafaxine, because various antidepressants can help to regulate narcolepsy and they thought they’d test it out on a willing guinea pig. Was a total failure for me, as I couldn’t keep it down long enough to see the effects — do you get nausea off it? Glad to see you posting again, mate. Chin up, stiff upper lip, awkward man hugs and all that kinda deal. Cheers Stu. Thankfully I don’t get the nausea from venlafaxine but boy do I notice if I miss my dose by even half a day. Nasty withdrawal symptoms are quick to kick in – brain zaps! I guess my point in this post (which I perhaps didn’t explain adequately) was my doubts over the effectiveness of any of these meds at stabilising my depression. Therefore what would happen if I made a (phased) elimination of them. We’ll have to see how this goes. Do you know what we are all slave to the modern world in some way. Whether its pills, iPads or junk food. You can beat yourself up over stuff but ultimately you have to have faith in a regime that works for you. You are dealing with something really tough day in day out and if they help even a little bit to soften the edges and give you the opportunity to relish the time with those you love then I think that’s a pretty fair exchange. You are a good man. You bought me a wall. Cyclical depression may come and go despite the meds, but if they take the edge off the downswings, that’s probably a good thing. Hang in there. Did you have a controlled reduction of paroxitine? As I just replied to Stuart withdrawal symptoms can be pretty harsh on some of these but I wonder what happens once you break free of them. I was beginning to write a response when my computer crashed on me. Probably a good thing since it was turning into a diatribe about my year long tale of woe about anti-depressant meds. To cut a long story short, SSRIs have been my saviours for the past ten years. I have been on and off them for the last ten years and they’ve lifted my mood and given me back my sleep when I’ve needed them too, fortunately without side effect (though I was on a fairly low dose each time). I never really gave it a second thought until just before Christmas last year when Citalopram no longer worked for me. I had a really torrid time over Christmas and into the New Year with no sleep at all and chest pains which landed me in A&E….My GP then put me on Trazodone which had only minor successes in terms of allowing me some sleep for a few nights and then I was back to little or no sleep at all. Eventually collapsed from exhaustion some time in March and went to stay with Mum and Dad in Gloucestershire and registered as a temporary patient at my old GP practice (who were brilliant and could not do enough for me). They immediately took me off trazodone and put me on Venlafaxine (Venlalic) which I’m still taking. I had to supplement that with Zopiclone to help me get some sleep for the first couple of weeks but luckily came off those as soon as the Venlafaxine started to take effect (which took about 5 weeks in total). Venlafaxine has been brilliant for getting me back on my feet but for me it has come with weight gain and tiredness (although equally that might be down to eating a shed load of biscuits and cupcakes). I’ll be on my current dose until at least March next year, which is fine with me and then I’ll discuss reducing it with my GP. I’m quite worried about coming off it as I’ve heard that the withdrawal symptoms can be horrendous). It does make wonder whether I’m on a ‘career’ of medication now. Am I on these for life now or will there be a time in the future when I can come off them for more than 6 months without crashing and having to go back on them. My Dad was on Venlafaxine (Effexor) years ago following an episode of depression but he had a diagnosis of bipolar disorder a few years ago and now has to take a combination of anti-depressants (Citalopram), mood stabilisers (Depakote) as well as a Clopixol injection when his illness has been really bad. I have mixed feelings about the efficacy of the meds. Certainly a year ago I would have been extolling the virtues of SSRIs. Now I’m not so sure after my recent experience whether it’s the anti-depressants that have saved me this time round or whether changes in my lifestyle and outlook on life (like not working such stupid amounts of hours and taking a lot of pressure off myself) have also made the difference. Hey Ron. 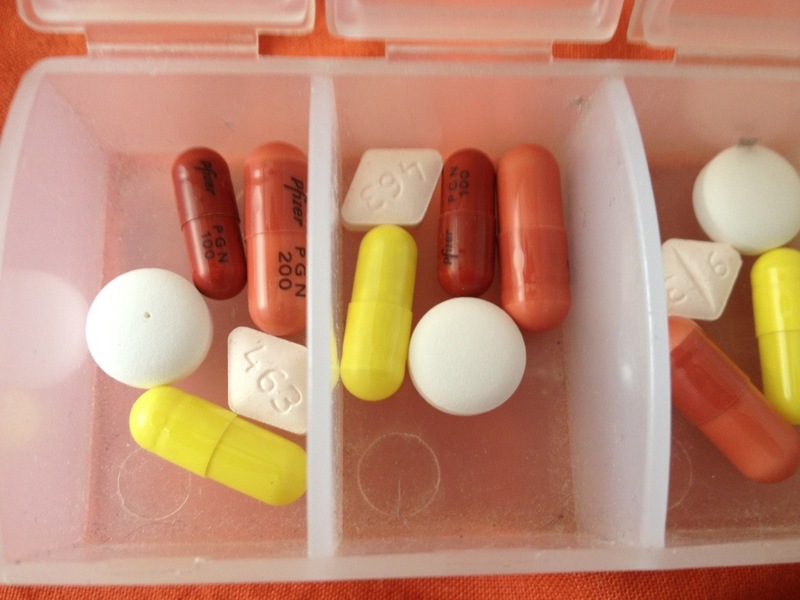 Thanks for sharing that – really interesting to hear someone else’s meds experiences. Am glad someone else questions the efficacy of these things. Yes, the truly horrible potential scenarios like the one you outline re your dad aren’t worth thinking about and it sounds like with the bipolar he really needs the chemical rebalance that those drugs provide. But for you, me, and many many others are we being prescribed these pills too quickly? Are other treatments not being given enough credence? Is this a resource issue – ie it’s easier for the NHS to dish out pills than invest in good counselling. Btw it’s also good to hear you had a positive experience from your ‘old’ GP. Seems to be a lottery.